Boat to/from the island (Scorpion Anchorage); various day-hiking choices on the island. 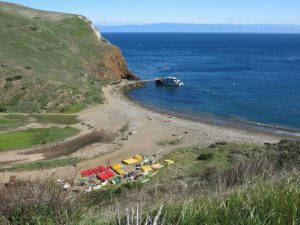 We’ll take a 20-mile Island Packers boat trip from Ventura Harbor across the Santa Barbara Channel to the Scorpion Anchorage near the eastern end of Santa Cruz Island (the largest of the eight Channel Islands off the coast of southern California). The boat will arrive on the island about 9:00 a.m. and we’ll depart from the island at 4:30 p.m. NOTE: Participants must arrive at the Island Packers facility in Ventura Harbor by 7:00 a.m. on the departure date (we should arrive back at Ventura Harbor around 5:30 p.m.). Click here for more information about Santa Cruz Island. This special event is open to current members only. We’re limiting the size of our group to no more than 19 persons. No dogs allowed on this event.